Padraig Byrne from Kilkenny with sheep from Malinhead flock at the 9th Annual suffolk female pedigree sale in Blessington Mart on Saturday. 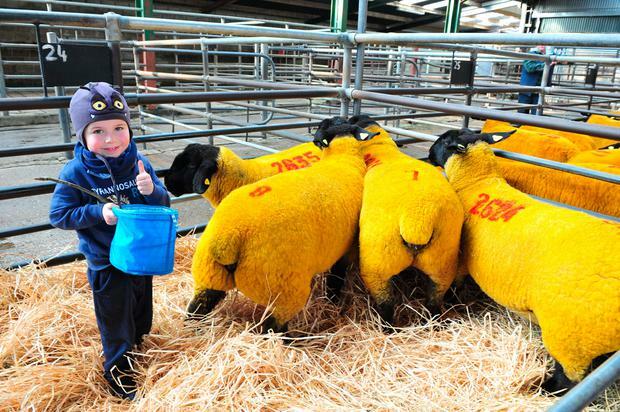 One Lot from the flock made €2,000. Photo Roger Jones. Winter is coming, or it has arrived depending on what part of the country that you are in. In fairness, it has been a lot easier than last year and is a welcome relief to both livestock and farmers as housing has been delayed significantly compared to other years. However, as tempting as it might seem, you still need to clear fields that you intend to use in the spring for lambing. A week of extra grazing in winter, I've heard the older generation remark, could cost you a month grazing in spring time, so don't be complacent and rest on your laurels too much. Aim to have 90pc of your farm closed up by mid-December. My lambs are slowly but surely coming fit. They have ad lib access to meal and I intend to draft them off as quickly as possible. They are within touching distance of being fit so the meal literally tops them off relatively cheaply. It's good to get them away. When I think back to what I went through bringing them into the world, it literally sends a shiver down my spine. Nevertheless, time passes through the roughest hours. Lamb price is gradually drifting up in the right direction but it is, as always, about €1 per kilo off where it should be in order for farmers to make a living from commercial sheep farming. It's at this point in the year when things are relatively quiet on the farm that you have time to reflect on where you are going with your business. The tax man has his fun, the insurance premiums inevitably go up, as does pretty much the cost of everything we do, but the cost of the product we produce is continually pushed down and we have to wait for the subsidies to arrive to compensate us for keeping the price of food low. The candle is being burnt at both ends for sheep farmers. I tipped down to Kilkenny to see the energy expo last month, and what an eye-opener it was. The potential for farmers to generate their own energy needs is massive. It's only a matter of time before every farm in the country will be energy contributors rather than energy users. If they are allowed to, that is. They've been at this on the continent for the last number of years. A German friend of mine remarked when I was talking about this, that in Germany, instead of getting a bill every two months for electricity, they get a cheque for the energy that the solar panels on the roof of their house generates for the grid. We can't yet do this in Ireland because the powers that be are preventing energy producers from off-loading their surplus energy to the grid - you can do it, but you won't get paid for it. When you hear the climate change debate castigating farmers for being the big polluters, you cannot help but get extremely annoyed as agriculture is very much the solution to climate change rather than being the problem. We could do without the outrageous statements from the Dublin 'elite thinkers' brigade spreading sensationalised mis-information on climate change which too often points the finger solely at farmers, as they drive off to grid-locked roads. There is no other industry on the planet that has more potential to sequester carbon or operate in a carbon neutral capacity than the agricultural industry. The vested interests that are preventing this will have to be pushed to one side.